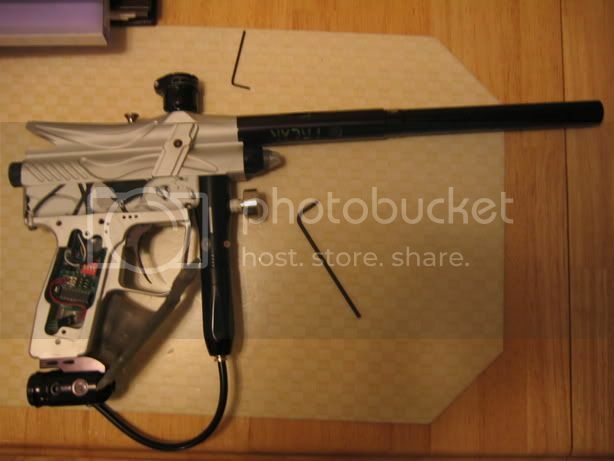 Silver B2K4 with DM4 board and crazy ups. 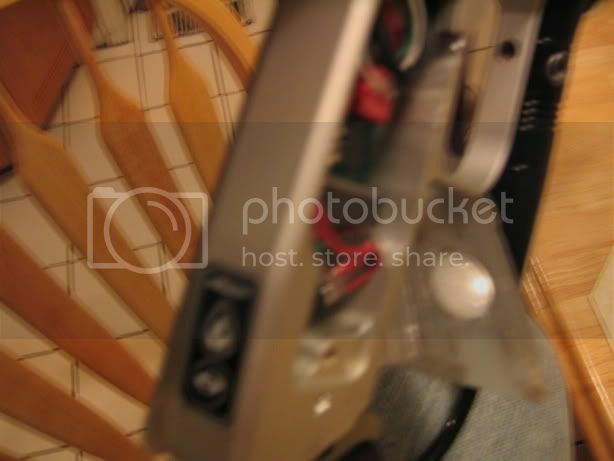 Posted: Tue Dec 20, 2005 6:30 pm Post subject: Silver B2K4 with DM4 board and crazy ups. I have for sale a 2004 Bushmaster in the Matte silver Color with the following upgrades. 14' Black Freak with AA Tip. 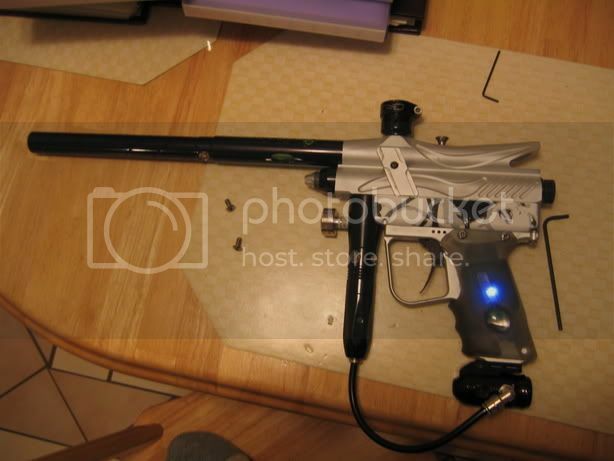 I have played with this gun in the 2005 PSP Chicago and World Cup events with no problems. This is crasy fast, no chops and very reliable. In the 3 years I have had this weapon of mass destruction it has only failed on me once. The cup seal came unscrewed from the shaft it sits on and it has been loctited on with no problems since. 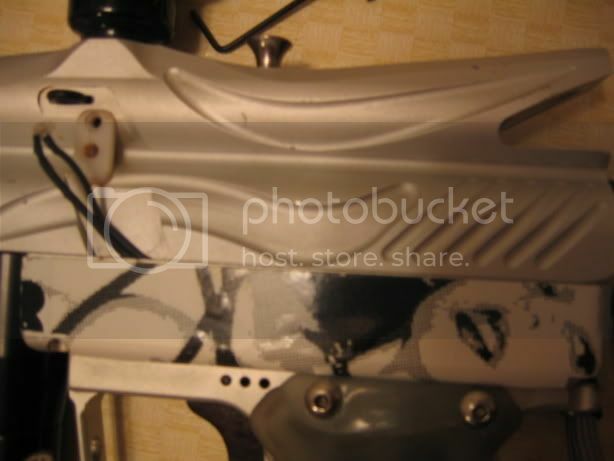 Im selling this because I am getting an aprtment with my girlfriend and need the money. I am open to prices, just post and I will respond. 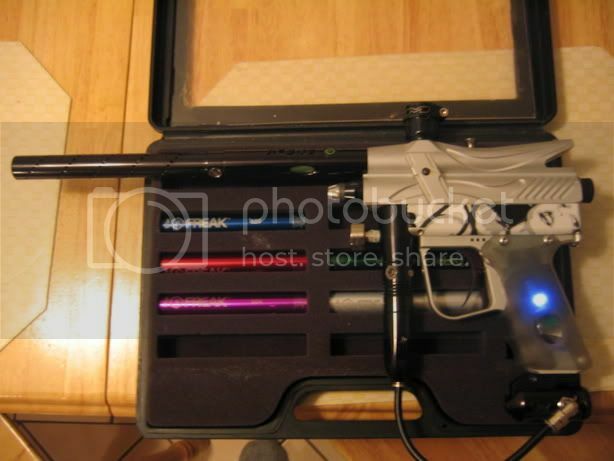 Please keep in mind I have alot of money invested in this gun. The DM4 board retail for over 120$, the chip was 60$ when I got it, membrane pads are 9$ a peice and wiring harnesses are like 30$ and the eyes are 40$. Paypal is preffered but money order is acceptable as well. My ebay account name is "Dyecoreblue" if you need some sort of feedback history. so, how much for this pig? like i said i dont really know what to price it so throw an offer. so if im understanding this right, this theoretically means you could use any dm board in this gun. so theoretically, you could mut THump M7 in a bushy. and again theoretically, you could have one crazy @$$ bushmaster. free up for this, someones gotta buy it! who wouldn't want it! 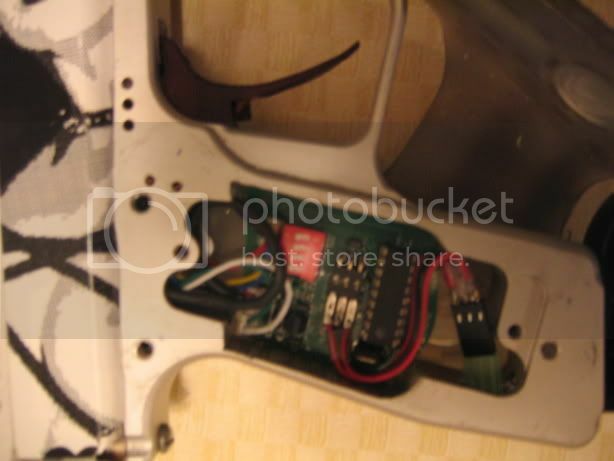 yes a thump board in this gun would work... right now it has an M3 chip from Tadao. I guess ill post a price and see how it goes... 550$ shipped for the gun, freak kit and a Red and Black Profiler but the mask needs a new lense. This gun is a killer. Common someone wants it. here are two videos, first is me testing the eyes. Second is the gun in psp mode capped at 15 and the halo b is running at setting 2 with only 4 AA's. do u take trades? if u do would u want a freestyle?